In this study, as shown in [Table 1], majority of the patients were of 6–10 years of age (41%), followed by 23% in 11–20 years' age group and 18% patients in the 20–30 years' age range. Minimum patients were in the age range of 71–80 years. Female patients constituted the majority (55%) in the study as given in [Table 2]. Seventynine percent of the isolates showed pure growth, whereas 16% were mixed growths and no growth was seen in 5% patients which is depicted in [Table 3]. Staphylococcus aureus (32, 40.52%) and Pseudomonas aeruginosa (29, 36.7%) were identified to be the most common causative bacteria as pure growth. 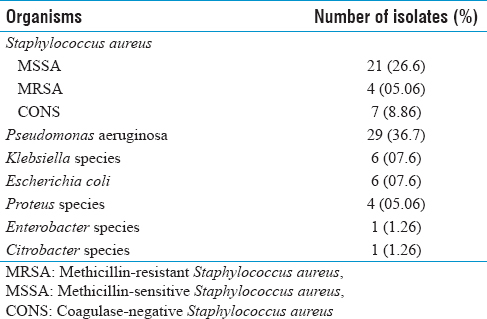 Methicillin-sensitive S. aureus (MSSA) isolates were more in number than methicillin-resistant S. aureus (MRSA) or coagulase-negative S. aureus (CONS). The remaining 18 isolates were growing the other bacteria (Klebsiella spp., Escherichia More Details coli spp., Proteus spp., Enterobacter spp., and Citrobacter sp.) [Table 4]. In [Table 5], S. aureus (31.25%) and P. aeruginosa (31.25%) were identified to be the most common causative bacteria as mixed growth. MSSA isolates were more in number than MRSA. Other organisms grown were Klebsiella species (6.25%), E. coli (6.25%), and Proteus species (25%). Pseudomonas showed maximum sensitivity to amikacin (82.3%) and ciprofloxacin (76.5%). Maximum resistance was to azithromycin (85.3%) and clindamycin (79%) [Table 6]. Maji PK, Chatterjee TK, Chatterjee S, Chakrabarty J, Mukhopadhyay BB. The investigation of bacteriology of chronic suppurative otitis media in patients attending a tertiary care hospital with special emphasis on seasonal variation. Indian J Otolaryngol Head Neck Surg 2007;59:128-31. Poorey VK, Lyer A. Study of bacterial flora in csom and its clinical significance. Indian J Otolaryngol Head Neck Surg 2002; 54:91-5. Malkappa S, Kondapaneni S, Surpam R, Chakraverti T. Study of aerobic bacterial isolates and their antibiotic susceptibility pattern in chronic suppurative otitis media. Indian J Otol 2012;18:136. Available from: http://www.indianjotol.org/text.asp?2012/18/3/136/103440. [Last acessed on 2018 Sep 29]. Loy AH, Tan AL, Lu PK. Microbiology of chronic suppurative otitis media in Singapore. Singapore Med J 2002;43:296-9. Sharma K, Aggarwal A, Khurana PM. Comparison of bacteriology in bilaterally discharging ears in chronic suppurative otitis media. Indian J Otolaryngol Head Neck Surg 2010;62:153-7. Sanjana R, Singh Y, Reddy N. Aerobic bacteriology of chronic suppurative otitis media (CSOM) in a tertiary care hospital: A retrospective study. Coll Med Sci 2012;7:1-8. Available from: http://www.nepjol.info/index.php/JCMSN/article/view/6673. [Last accessed on 2018 Sep 29]. Nazir A, Kadri SM. Aerobic bacteriology of chronic suppurative otitis media: A hospital based study. Int J Res Med Sci 2017;2:15215. Available from: http://www.msjonline.org/index.php/ijrms/article/ view/2454. [Last accessed on 2018 Sep 29]. 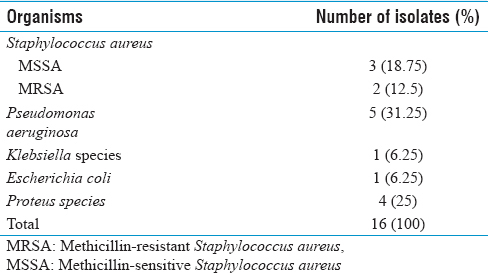 Patigaroo SA, Wani SM, Anjum N, Islam M, Sumbrai D, Ahmad R. Drift in the bacteriology of chronic suppurative otitis media and methicillin-resistant Staphylococcus aureus as an emerging pathogen: an experience. Int J Med Sci Public Health 2016;5:671-7. Avaialble from: https://www.ejmanager.com/mnstemps/67/671437023413.pdf. [Last accessed on 2018 Sep 29]. Saini S, Gupta N, Aparna, Seema, Sachdeva OP. Bacteriological study of paediatric and adult chronic suppurative otitis media. Indian J Pathol Microbiol 2005;48:4136. Moshi NH, Minja BM, Ole-Lengine L, Mwakagile DS. Bacteriology of chronic otitis media in Dar es Salaam, Tanzania. East Afr Med J 2000;77:20-2. Fliss DM, Dagan R, Meidan N, Leiberman A. Aerobic bacteriology of chronic suppurative otitis media without cholesteatoma in children. Ann Otol Rhinol Laryngol 1992;101:866-9. Indudharan R, Haq JA, Aiyar S. Antibiotics in chronic suppurative otitis media: A bacteriologic study. Ann Otol Rhinol Laryngol 1999;108:440-5. Mansoor T, Musani MA, Khalid G, Kamal M. Pseudomonas aeruginosa in chronic suppurative otitis media: sensitivity spectrum against various antibiotics in Karachi. J Ayub Med Coll 2009;21:120-3. Available from: http://www.ayubmed.edu.pk/JAMC/PAST/21-2/Tahira.pdf. Jang CH, Park SY. Emergence of ciprofloxacin-resistant Pseudomonas in chronic suppurative otitis media. Clin Otolaryngol Allied Sci 2004;29:321-3. Altuntas A, Aslan A, Eren N, Unal A, Nalca Y. Susceptibility of microorganisms isolated from chronic suppurative otitis media to ciprofloxacin. Eur Arch Otorhinolaryngol 1996;253:364-6.